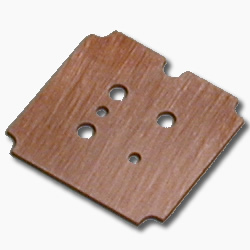 Copper Heatsinks — International Etching, Inc. This 110 Copper Heatsink is .020″ x .650″ square with a tolerance of +/- .002″ and has a 63/37 solder plate of 100-200 micro inches thick. All coppers are easily and economically machined utilizing the photo-chemical machining process. This part is completely stress and burr free with exceptional flatness.